The civil unrest in Riga, Latvia has been called the "Penguin Revolution" because of something Latvian Prime Ivars Godmanis said in his New Year's address. Godmanis apparently urged people to huddle together like penguins to stay warm. On Tuesday Jan. 13 a peaceful protest in Riga, Latvia -- which has the highest unemployment rate in the EU -- erupted in violence. On Wednesday, 2,000 people threw snowballs at the parliament in Sofia, Romania. By Friday, unrest had spread to Vilnius, Lithuania. The riots in the capital of Vilnius were nearly the same as those in Riga according to the NY Times. There live bloggers have documented what happened where it all began: events in Riga, Latvia. Aleks Tapinsh, Interview with a protestor (audio in English). 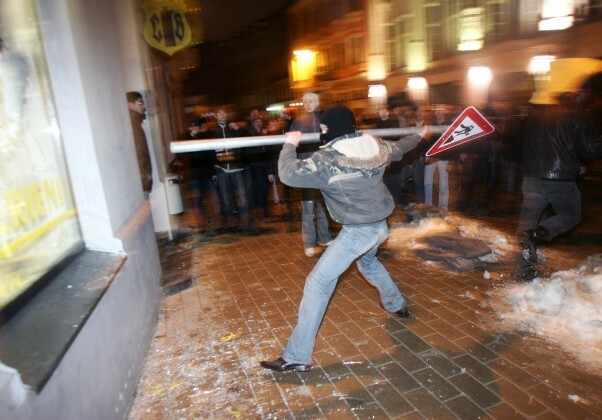 Video - Riots in Riga!